Films I Might Have Underestimated: There is such a thing as an overstuffed package, but is there really a problem with too much of a good thing? I doubt I can be persuaded that A Christmas Tale is a perfect film, with Amalric starting to spin familiar variations on his Desplechin persona and the curlicues and digressions not in every case augmenting the overall evocation of a family in warm disarray. But is it just because Christmas is once again drawing near, or because the new Criterion disc looks so spiffy, or because I still can't figure out why the theater was so empty when I saw it that I find myself feeling defensive on behalf of this movie? Only one way to find out, really. 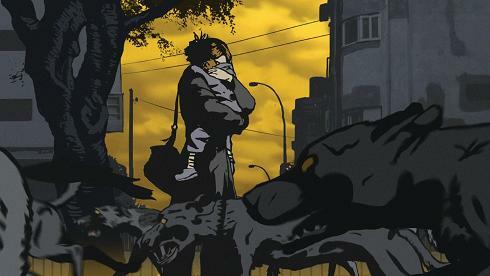 I still feel that Waltz with Bashir would have benefited from a more diaphanous, less hard-looking style of animation, since Folman's chosen aesthetic occasionally looked a bit thick and clumsy and didn't always jell with his overall thesis about the lapidary, palimpsestic qualities of memory. But I might need to take a second spin at engaging with the movie he made, instead of the alternate one I was unspooling in my mind, and not worry so much that I dislike the cut to "reality" at the end. Among 2008 releases that didn't show up theatrically in the U.S. till this year, I still don't think Sugar is as much of an eye-opener as Boden and Fleck's Half Nelson, but it's a sturdy, poetic, and similarly non-judgmental piece of work. I have been pleased to see it cropping up on prominent year-end lists like that published by the American Film Institute, after its theatrical run proved so quiet, and I'm primed for a second taste, knowing that the middle third won't necessarily stack up against the first and last. With five A's and fourteen B+'s awarded this year, I needed to include one of my B's for a Top 20 of 2009 list that someone recently requested, and it didn't take me any time at all to opt for Sugar. Films I Might Have Overestimated: Something about the Dardennes' Lorna's Silence felt to me as though the revered brothers were at last feeling their way separately through each narrative and psychological beat of the story, rather than holding throughout to an aesthetic structure that speaks more holistically to the spiritual or sociological truths they have already mapped onto the entire tale, which is how I felt about L'Enfant and, even more so, about The Son. I felt much closer in this case to a worldview and a moment-to-moment experience that approximated Lorna's, even though the movie doesn't literally inhabit the perspective of its main figure any more than the others do. That's why I gave Lorna my highest grade for any Dardennes movie, but then I keep reading lots of other folks who found this to be a kind of plateau film for them, perpetuating without advancing their style, if not an actual step down. Different strokes, perhaps, or maybe I really am missing some boat. I'm certainly intrigued to go look, though it still says something that Lorna is the film that has finally motivated me to look back at all their features in sequence. Otherwise, for reasons I discussed in the comments thread for the 2006 entry, I'm a believer in the coolly received 007 outing Quantum of Solace, though I recognize some problems getting it off the ground, and the shortcomings in romantic exploits and narrative coherence. One Way or Another, I Need Another Look at: I saw Quantum of Solace as part of my giddy trip to London, and a combination of festival delirium and tourist's excitability could have fed into my sanguine reaction. The same factors have nagged away at my tepid response to James Gray's Two Lovers, a film that has finally succeeded in rallying parts of the American blogosphere to Gray's cause. I have the problem here that others have with Lorna: I feel like it's a diluted and limited version of what Gray has done to sharper effect elsewhere. Still, I'm so glad to see his fortunes tick up after all the weird ignoring or even condescension about We Own the Night and The Yards that I'll take another whirl at it, even on the off chance that I like it better. As for Kelly Reichardt's Wendy and Lucy, I have to admit that it typifies a style and a stratum of independent moviemaking that I want to endorse, more than a specific movie that I feel able to get too worked up about. 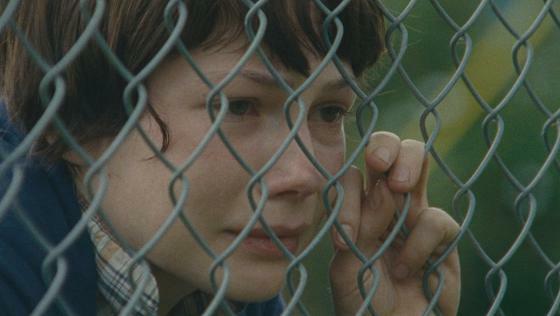 I don't know how to say this without sounding like I'm critiquing Michelle Williams's looks, which really isn't the kind of thing I go in for, but as an expressive tool, I just find her face really hard to form a connection to onscreen. In close-up, she has a kind of fistlike quality to me: it doesn't give much, and it seems almost designed to keep an impenetrable grip on whatever it's holding back. I wanted either a genuine non-actor in the part or a slightly nimbler character actress, though I've never had any epiphany in deciding who this would be. The structuring "hum" really got to me, and a few of the key storybeats felt disappointingly predictable, even on the verge of stock. Still, I'm keen to rally behind legitimately non-Hollywood voices, and as a snapshot of a region and a resourceful but roundly outflanked way to live your life, Wendy and Lucy sure makes an impression. Women in the Director's Chair: What everyone said at Cannes in 2009 has generally characterized my reaction to most of the last two years in filmmaking: I'm excited to be hearing from these artists again, but in almost all cases, these aren't the particular films I'll really want to remember them for. Claire Denis's 35 Shots of Rum certainly bears out her oft-cited inspiration by Japanese domestic dramas, radiating a kind of tact and simplicity and an unfussy, over-the-shoulder grasp on all her characters that would be the envy of many auteurs. But it has one of the blandest scores of any of her movies, so much so that it actually cheapened the movie for me, and she has certainly enabled her ambitions toward "succinct restraint" by devising characters who don't say much and whose conflicts and relationships feel a little boiled-down. As a peephole into city living in a culturally hybridized age, it can't get anywhere close to I Can't Sleep, but the final shot is both a lovely gesture in itself and a kind of retrospective emblem for Denis's whole attempt at metonymic, oblique access into elliptical states of feeling. I'm eager to re-experience the whole film with that final impression as a kind of stylistic touchstone. Lucrecia Martel's The Headless Woman finally found its way to American screens near the end of this year, and though one of my favorite things about Martel is how much she challenges herself and her audience by obfuscating character relations and identities, The Headless Woman risks pushing that unorthodox tendency into unproductive mannerism. How many shots from behind her protagonist's head or just over her shoulder is Martel going to give us? Part of why this works in La Ciénaga and The Holy Girl is that while she never effaces the strongly marked perspectives in her shots, she also isn't flaunting or fetishizing her refusal to get closer or go simpler, and I think that's what Headless Woman too often does. That the main character is probably the least nuanced and the most prone to a purely metaphorical or ideological reading in Martel's three-film canon doesn't help. Thank goodness, then, that however mannered or not, her marshaling of image, sound, narrative, montage, and mystery are all so rigorous and distinctive that you're bound to have a suggestive experience, and a wondrous relief from the rote storytelling of so many other movieseven if this one doesn't prove commensurate with the expectations the auteur has so rapidly established for her work. 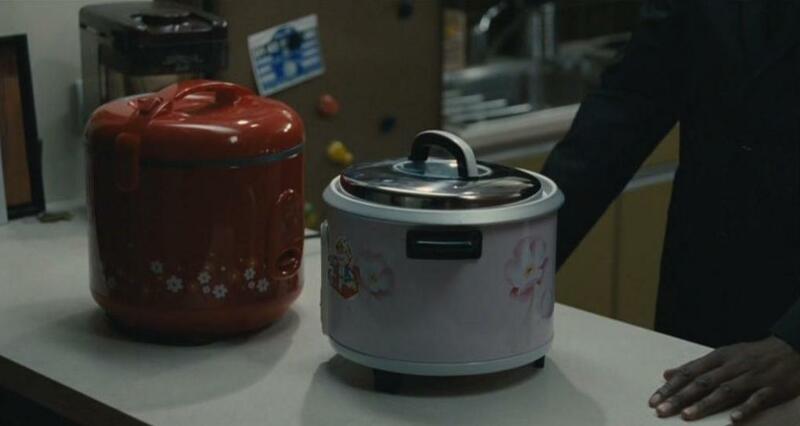 Or maybe I just need a second impression. Certainly lots of critics passed from indifference to enthusiasm after the film had settled for a while. Awaiting Distribution: Here are two festival titles that will be at least two years old by the time a broader audience ever sees them, but the wait will be more than worth it. First Run Features will distribute the documentary Prodigal Sons in select cities this spring, and better news is hard to imagine. So many autobiographical, in medias res documentaries have the Tarnation or Capturing the Friedmans problem of seeming to get off on one's own exhibitionism, or relishing the clammy, tragic, unpreventable failings of one's own loved ones. Prodigal Sons has got a true-life narrative to beat the band, and it wends into some dark areas. Still, that's far from the whole story, and anyway, what's exciting isn't just the courage and candor that director Kimberly Reed brings to this documentation of her own life, her older brother's, and their surrounding family's, but the unexpected resonances she explores among the various subjects on which these journeys all turn: adoption, heredity, gender identity, family loyalty, regional stereotyping, mental health, global celebrity, and the duel between love and danger. It's the funniest, warmest possible movie to build around a saga with so many volatile depths, and it's much more polished and rigorously self-editing than these kinds of self-examining pieces usually are, particularly from first-time feature directors. I truly don't want to divulge the narrative levels and turns for those who haven't seen it, but when Nathaniel and I bought tickets last spring, I thought I was seeing an LGBT feature, and he thought he was seeing a movie about classic Hollywood, and we briefly wondered whether we'd bought tickets to different films with the same title. But no, we were both right. And the film is even more right. Performances I'm Most Eager to Revisit: Blindness is the sort of laundered, sometimes shapelessly internationalized adaptation of prestige lit that you wonder about seeing it once, much less twice, but I have to say this for Julianne Moore: in a part that carries a huge lure for metaphorical or melodramatic grandstanding, and for an actress who's been frivoled away by a lot of her recent films, Moore stays fantastically true to the direct, warm, everyday qualities of the character. It's the single performance of hers stretching all the way back to Far from Heaven that I'm most interested to reassess. 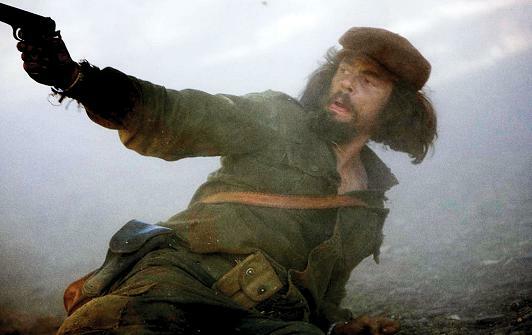 It takes so long to get the hang of Che's understated approach to its character and its inchoate ideas about how to make the project cinematically viable that a lot of Benicio Del Toro's performance had passed before I could really lock into to a scrutiny of his scrupulous downplaying. There are some memorable moments of physical acting toward the end, but it's otherwise such a slow burn, but hugely admired by some actors I know, that I'm tempted to cordon off four hours of my life at some point to give it another shake. Sally Hawkins was the critical darling of last year for her daring exploration in Happy-Go-Lucky of the borderzone between grating and endearing. I think the film needed more re-writes, and almost every other performance I'm tempted to revise or even recast, but I want to contemplate the secret to Hawkins's success, even though she landed just outside my own list of five favorites in her category. Even closer to that group, but not quite there, was Emma Thompson's heartbreaking distillation of middle-aged fatigue, cautious optimism, disappointment, and hard-won pluck in Last Chance Harvey, a movie that looked so much like an awards-season throwaway that lots of people stayed away. But Harvey is like watching Thompson stretch her small, moving, film-rescuing turn in Love, Actually to feature length, and Dustin Hoffman and Liane Balaban are very nearly as good. I can imagine lots of people who would want to see Last Chance Harvey moved to the "Films I Might Have Overestimated" category, but I won't do it: it's sensitive, it's measured, and in Thompson's case especially (but not only), it's sublimely performed. In fact, I might pop it in the DVD player right now. Runners-up: Korean barnstormer The Good, the Bad, and the Weird; The Betrayal (Nerakhoon), a documentary co-directed by ace Eternal Sunshine cinematographer Ellen Kuras; the increasingly topical documentary Roman Polanski: Wanted and Desired; the Brazilian prize winner Linha de passe; Baghead, from Mumblecore's celebrated Duplass brothers; L'Autre, which won Dominique Blanc the Best Actress award at Venice; Aussie hit The Black Balloon; the Argentinean women's prison drama Lion's Den (Leonera); the body-paint and prosthetic explosions of Hellboy II: The Golden Army; and Charlize Theron, showing her indie spirit in Sleepwalking. But I clearly need more help here. Pipe up, folks! I also love, love the simple but so effective choice of having the characters look into the camera at certain, specific points during the film. The characters are reaching out for help, and this choice just emphasizes and underlines that perfectly. I am angry about Two Lovers right now because i've been meaning to see it all year. and i go to watch the screener last night and it has huge bolded "property of" ON the image (rather than underneath it) that never goes away (usually they make recurring appearances and don't generally interfere with the image) PLUS a company logo blocking the top right hand of the screen. that is all kinds of messed up. So i couldn't bring myself to watch the movie while only being able to see 3/4 of it. I sort of despise WENDY & LUCY and would say that Williams' impenetrable perf is only the tip of the iceberg. The older I get, the more intolerable I find movies without any hint of levity; I realize her predicament is the pits, but Christ, give me *something*--a funny bit of background humour, a comic gesture. It's as if Reichardt's terrified of breaking the spell by letting the clouds part for even a moment, but instead I just became desensitized to all the misery. (I know she invoked the name Bresson a lot, but it's not as if she and Bresson are culturally interchangeable.) Also, I'm not the first person to ask this, but was it really necessary to undercut the security guard's charity with that closeup of a $5 bill? It felt more hostile to me than anything in the SAW saga. Let me advocate in favor of Still Walking. It's the best 2008 film I've seen and it will be available for instant viewing on Netflix later this week. Don't let your reservations about Air Doll hold you back! I have such a thing against Waltz with Bashir. I wrote "The most potent moment of Ari Folman's Waltz with Bashir is the final minute. Tellingly, it is the only minute of the film not told in so-unstylised-it-becomes-stylised animation. That this so-called documentary (I don't think it's anything close to being one) is in animated form harms it in ways that only become clear during these final moments of real documentary footage featuring grieving wives and mothers on the destroyed streets of Lebanon in the early 1980s", and I still stand by that. How it is a documentary in even the vaguest of ways alludes my futile brain. And the animation is just sort of annoying in it's desperation to be seen as arty.